Brought a flat tire in first thing Saturday morning. Im from out of town so I had to make sure I could get it by the end of the weekend to head back home. Was "guaranteed" that it would be done by 5pm as they were not open Sundays. Arrived at 5pm and was told they hadnt even started to work on tires yet and I could try calling at 6pm to see if they had a chance. No phone call to notify me they were running behind nothing. They closed at 5pm so I couldnt risk they would be locked up when I returned. Extremely disappointed and would never recommend someone utilize this branch given the poor dependability. Brought my truck in for an along mentioned about 3 months ago drove to Toronto about 3 time and no other driving in between noticed my tires were wearing out the same spot on each tire brought it to Kal tire in Cambridge they told me it was my tires and to not to worry and to maybe buy new tires since I have mud tires went to work for 2 weeks in Toronto and came back to Sudbury went to Kal tire on Friday and they looked at it said it was the alignment and they replaced the tires and doing another allingment honestly this is the best service Ive had ever with truck issues like this. I cannot resist but to come on here and inform other staff and management that the female employee Mackenzie at this Webbwood location is very much an asset to you. today she has taken my issue seriously and helped me get in and out. Me and my family have been through intense stress this past year. Im glad there are workers like that involved with assisting people in situations like this that can be very aggravating and always come at the wrong time. Just felt it needed to be said, Great work Mackenzie. keep it up. I love this place. Bought my winter tires here, couple years ago. I wanted a certain skin but they recommended a different tire.. his name eludes me but I loved them so much i came back and bought my summer skins on recommendation from MacKenzie, again, love them! Everyone is always smiling when I come in and I enjoy going there. In fact, I dont bring my ride anywhere else now. Great bunch, keep it up KalTire! Was very disappointed yesterday when I was told they couldnt help me they were too busy and I should call CAA. Didnt offer to book me the next morning she just said she was trying to help. I was there by 430 and they didnt close until 6...I have always gone here anytime I needed anything and always been served, guess theyve lost my business...GCR tire helped me. 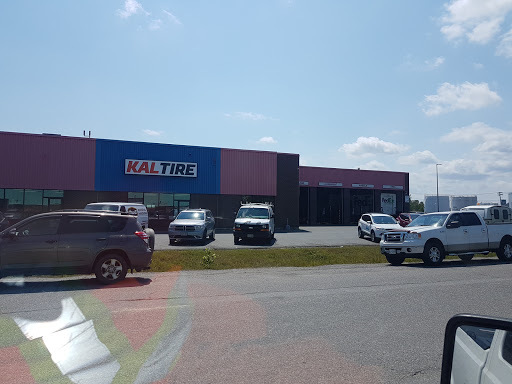 The staff at Kal tire on webwood drive are phenominal they are friendly, courteous and very knowledgeable. You never feel like a number they take their time and answer all your questions. The only better thing is their pricing. If they have it you cant beat their price and if you can let them know theyll make it right. I wont bring my car anywhere else. Have an appointment? Too bad, because you will be waiting for hours and hours watching people who just showed up get their cars before you. Im sorry but if you make an appointment you should be getting service first. Dont care if you are busy, maybe dont oversell yourself. Never coming to KalTire again. I went for snow tires and asked for studded tires. I was told they had no more in stock so I went with what they had. Turns out the tires they put on my truck were pre drilled for studs.... I have had other issues also when I went for an oil change and they forgot to put oil back in my vehicle. The staff were so helpful. They did their best to find me tires and fit me in when they were very busy. They called with updates when needed and shuttled me to work. Absolutely would recommend Kal Tire to anyone needing tires. Honest, quick, precise from drop off to pick up. The entire process was proficient. Big thanks to Darren, the mechanic who took the time to explain everything to me. I will definitely be a repeat customer. Bunch of crooks! Had a nail in tire edge last July. Instead of just changing 1 tire, they recommended changing 2 tires. My fault for trusting their recommendation. Beware anyone else going to this store. I will definitely be returning to this Kal Tire location. I dealt with Kyle and he was super friendly and helpful. The free refreshments are an added bonus! Amazing service and very knowledgable technicians. I trust I get the right parts and service along with personal, pleasant customer service. Awesome Service! Mackenzie went out of her way to ensure I was taken care of as quickly and efficiently as possible. Thank you!!! Fixed punctured tire for free. Very friendly. Ill buy new tires here when I need them. Excellent service. ..the only place to buy tires !! Always a pleasure dealing with this location!